Making the transition to wearing glasses doesn’t have to be traumatic! We get tips from parents and experts on how to make the experience stress-free and confidence-building. How do I choose something my child will want to wear? “It is so important to let the child be part of the decision. There’s a huge range of glasses on the market for children featuring popular characters and grown-up styles. Unlike days gone by, glasses are now seen as a fashion accessory. With choices ranging in colour, style, brand and use, getting a pair that they feel happy in will make all the difference. Work together to find a pair that’s practical, but that your child wants to wear." 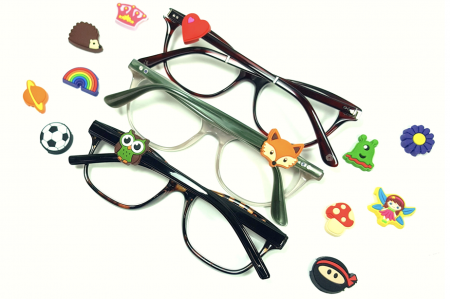 Eyewear accessory ranges are also a great option, allowing kids to customise their spectacle frames with soft charms. The Blinx range starts at £2.49 per charm. How can I make sure my child is responsible about their glasses? How can I encourage my child to be confident about wearing glasses? “One in five children has an undetected eye problem, so if your child has to wear glasses, it’s likely that he or she won’t be the only one in their class. However, if they do feel uncomfortable about wearing their new accessory, there are a couple of things you can do to relax them about putting on their glasses. What if my child is bullied because they wear glasses? “Turn your experience with bullies into something positive. You understand better than anyone what it feels like to be bullied, so use this knowledge to support younger peers who are going through the same thing. From Beatbullying, which works with children and young people across the UK to provide them with opportunities to make positive and lasting changes to their lives and outlook.